A characteristic sign of this pathology can be that among the few throm-bocytes seen in the blood smear, there is an increased presence of larger, i.e., less mature cell forms. The bone marrow in these thrombocytopenias shows raised (or at least normal) megakaryocyte counts. Here too, there may be an increased presence of less mature forms with one or two nuclei (Figs. 60,61). Drug-induced immunothrombocytopenia As in drug-induced agranulo-cytosis, the process starts with an antibody response to a drug, or its metabolites, and binding of the antibody complex to thrombocytes. Rapid thrombocyte degradation by macrophages follows (Table 29). The most common triggers are analgesic/anti-inflammatory drugs and antibiotics. "Idiopathic" immunothrombocytopenia. The name is largely historical, because often a trigger is found. > Postinfectious = acute form, usually occurs in children after rubella, mumps, or measles. Thrombocyte antibodies develop without an identifiable trigger. This is thus a primary autoimmune disease specifically targeting thrombocytes. Secondary immunothrombocytopenias, e.g., in lupus erythematosus and other forms of immune vasculitis, lymphomas, and tuberculosis. Post-transfusion purpura occurs mostly in women about one week after a blood transfusion, often after earlier transfusions or pregnancy. Thrombocytopenia in microangiopathy. This group includes thrombotic-thrombocytopenic purpura (see p. 144) and disseminated intravascular coagulation. Thrombocytopenia in hypersplenism of whatever etiology. Fig. 59 Continued. c Pseudothrombocytopenia. 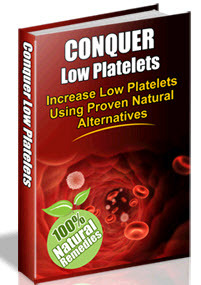 The thrombocytes are not lying ► free and scattered around, but agglutinated together, leading to a reading of thrombocytopenia from the automated blood analyzer. d Giant thrombocyte (as large as an erythrocyte) in thrombocytopenia. 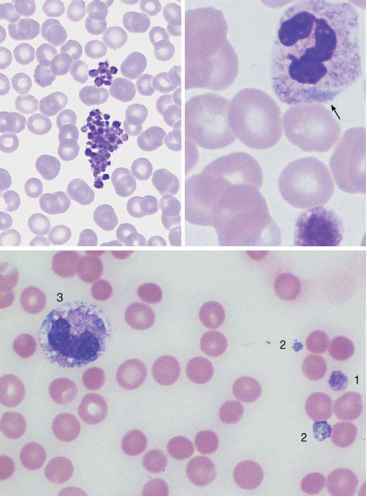 Dohle-type bluish inclusion (arrow) in the normally granulated segmented neutrophilic granulocyte: May-Hegglin anomaly. Fig. 59 e Large thrombocyte (1) in thrombocytopenia. Thrombocyte-like fragments from destroyed granulocytes (cytoplasmic fragments) (2), which have the same structure and staining characteristics as the cytoplasm of band granulocytes (3). Clinical status of sepsis with disseminated intravascular coagulation. In automated counters cytoplasmic fragments are included in the thrombocyte fraction.